Update: The Apple News Plus magazine list is below, and we found 271 newspapers and magazine in the new app, meaning you can expect more publications soon to meet that 'more than 300' promise. 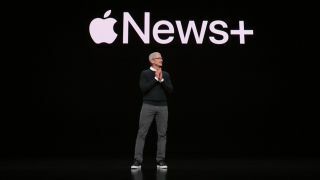 Apple News Plus is bringing magazines into the fold, according to Apple CEO Tim Cook during today's Apple TV Plus keynote, giving you access to over 300 high-quality digital magazines and premium newspapers in the Apple News app. It launched on Monday, March 25 in the US and Canada, and while Apple's fancy, curated RSS news reader will remain free, the digital magazines and newspapers will cost money – luckily just one flat fee for access to all of the premium content. Launching with iOS 12.2, Apple News Plus builds on the success of Apple News, which is already the No. 1 news app in the world, according to Cook. He cited its unique features like hand-picked stories, saying "it's critical that it's trusted." The new magazine portion of the app take cues from Texture service, a small digital magazine subscription service Apple bought last year. It was called 'the Netflix of Magazine' and that seems to be what Apple is doing here in the News Plus app. The addition of magazines is one of many services Apple has announced today. It's also releasing an Apple Credit Card, Apple Arcade bundled game app service, and Apple TV Plus. We downloaded iOS 12.2 and scoured the Apple News Plus magazine list twice (first by category and then by A-M and N-Z) to determine which magazines and newspapers were part of launch day. So far, we've found 271 titles. We've listed them below and weeded out duplicates in Apple's various categories – there are several similarities in food and health, for example, so we chose one for each. Some Canadian publications are repeated at the very end to give you an idea of region-focused mags. Publications like National Geographic were demoed to have Live Covers, or animated photos of what's usually on magazine covers. It's a preview of the interactive nature of the platform. There's potential here for a lot of fun, moving magazine parts. The National Geographic cover was followed by a table of contents (clicking on article titles whisked you to a specific page), and then to photo-filled articles. It's filled with text and infographics, and looks rather smooth when scrolling through the pages. Apple News Plus is about personalization, yet your privacy will remain intact – meaning advertisers can't track you. That was the first perk Apple touted (and it's championing privacy more and more in its product announcements). The all-you-can-read aspect was the next highlight. You're not going to have to pay for the 300 magazines individually. "I love the feeling of being at the newsstand," said Cook at Apple's keynote, noting that you're usually only able to buy one or two publications. Apple News Plus changes up the usual limitation with an all-read-you-read plan. The basic version of the news app will remain free, however, there'll be a News Plus tab that consists of magazine like Rolling Stone, Popular Science, Vogue and Outside. Like the old Apple News app, Apple News Plus magazines will be curated for human editors and then personalized to you from your device. New issues and featured articles will help you break out news content you'll want to read. Think of it as the hit single of a record. It'll let you bypass cover stories to find articles deep inside a magazine that are of interest to you. Premium digital subscriptions like Los Angeles Times, The Wall Street Journal, Wired and National Geographic are included in Apple News Plus, and this means there's a fee of $9.99 a month. Yes, you'll have to pay for written content (and actually support journalism), but all of the subscriptions would cost you over $8,000 a year. The value of Apple News Plus went up when Cook mentioned that, at no extra charge, it's available to an entire family through Family Sharing. Each person in your family gets full access to the entire catalogue on their devices and has their own personalization preferences. In this way, Apple News Plus takes cues from Apple Music. It's also free for the first month. Apple News Plus is now available with the iOS 12.2 update, since it launched on March 25. So far, though, it's limited to the US and Canada (in English and French), with 30 Canadian magazines and newspapers (we've named 27 of the 30 so far). Next up will be Australia and the UK later in 2019. Apple promises this will be the best mobile magazine experience ever. With the prevalence of 'fake news' and bots, that's a tall, but nobile order.